This article describes the use of an online professional learning community within the context of K-8 science education methods courses. The article describes the unique usage of the learning community with preservice teachers at different certification levels within the context of five distinct universities. While each approach is different there exists commonalities of usage. Specifically, the site is used to develop mastery of science content, exposure to pedagogical content knowledge, and classroom activities that focus on authentic science practices. Each case provides specific details of how the preservice teachers were immersed into a learning community that can serve them throughout their teaching career. What is the purpose of a science methods course? It would seem logical that a science methods course would increase the ability of the candidate to learn science content and pedagogy for that content. The actual methods for helping candidates learn to teach science are diverse and include different learning objectives, ‘student’ learning outcomes, and approaches within the classroom. A brief search of syllabi for elementary and middle grades science methods courses at the university level on the Internet yields vastly different approaches to teaching these courses and the reasons why. Science methods courses can be taught to “build fundamental knowledge of elementary science teaching and learning,” teach “strategies to bring scientific inquiry to the elementary classroom,” “increase confidence and enthusiasm for teaching elementary science,” “develop competence and confidence needed to teach science in elementary classrooms,” and “teach science skills and content.” Teacher candidates do not have the time nor training to be able to learn all of the content needed and experience the methods necessary for becoming an ‘experienced’ teacher in their first year of teaching. This article reviews how several university professors focus on a common approach to teaching a science methods course using an online learning community to guide teacher candidates to become lifelong science educators. Methods courses are teacher preparation courses designed to prepare teacher candidates to teach a particular content area. There are typically elements of the course that boost content knowledge, but the crux of these courses is allowing teacher candidates to learn and/or practice pedagogical strategies to teach that content effectively. Methods instructors must be thoughtful about not only the activities they employ in their courses to support this knowledge and skill acquisition, but also about the materials and resources they use to support the activities in the course. Moreover, methods instructors must acknowledge they cannot possibly teach everything one needs to know to teach in their content area. Consequently, instructors must also set the foundation for teacher candidates to strategically utilize resources, many of which may be online, so they will be lifelong learners. 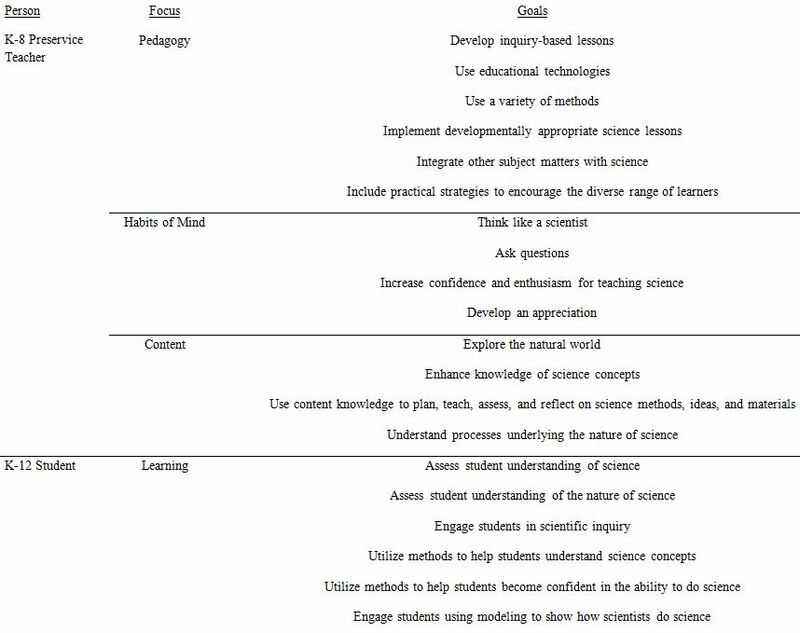 Table 1 provides a comparison of common goals of online syllabi from elementary and middle grades science methods courses. The search terms “elementary science methods syllabus” and “middle school science methods syllabus” were used in the Google search window. The first 40 results were downloaded and examined. Three main themes emerge from the syllabi: learning pedagogical skills to teach the science content, developing a set of habits of mind about science, and knowing the science content. In terms of the K-6 student impact, teacher candidates had to translate those skills to the students so that the students could essentially develop the same habits of mind and science content knowledge. Syllabi for courses that included the middle grades (5-8) demonstrated a change in the tenor of the language. When the middle grades course was combined with an elementary science methods course, the middle grades language, goals, and outcomes were very similar to that of the elementary methods course. At many universities, the middle grades science methods courses were combined with the secondary or high school science methods courses. The main differences between elementary and secondary science methods courses were the emphasis on depth of content knowledge and the lessening emphasis on developing habits of mind. Secondary science teachers are considered to have already developed significant content expertise and scientist’s habits of mind. Science teachers need science content knowledge and the appropriate pedagogical knowledge to teach at their respective levels. Elementary school teachers usually focus on pedagogy and multiple content areas, especially at the younger grade levels where classes are self-contained. In terms of elementary teacher candidates, it is well documented that they often feel unprepared to teach science or have negative attitudes towards science due in many cases to their own personal experiences with science education (Tosun, 2000). At the middle grades level, most teacher candidates have more preparation in one or two science content areas and as a result typically have greater content knowledge depth than elementary teachers. At the secondary level, science teachers have certification to teach one, two, or multiple content areas and are considered to have significant content expertise. Typically, secondary teachers hold at least a Bachelor’s degree in the content they teach. This system of silos can be summarized with a question asked to each level of teacher, “What do you teach?” The elementary teacher might say “children,” the middle school teacher might say “adolescent kids” or “science”, and the secondary teacher would say “chemistry” or “biology.” Content knowledge is needed by all science teachers at all levels. College does not prepare teacher candidates to teach all the content, concepts, and facts that teachers will encounter while in the classroom. Teacher candidates need examples of convenient approaches to learning more science content and pedagogy that can become part of their lifelong learning as professional educators. In addition to knowing the content, science educators at all levels also need the pedagogical skills to teach the content, which is often referred to as pedagogical content knowledge (PCK). As Bailie (2017) noted, “PCK has…become a ubiquitous word in the preparation of teachers” (p. 633). Science methods instructors have consistently devised activities and lessons to guide teacher candidates to develop the necessary skills for teaching science. For example, Akerson, Pongsanon, Park Rogers, Carter, and Galindo (2017) implemented a lesson study activity in their science methods course that resulted in the early development of PCK for teaching the nature of science. Hanuscin and Zangori (2016) asked teacher candidates to participate in an innovative field experience that led to the beginning development of PCK for teaching in ways consistent with the NGSS. Finally, Hawkins and Park Rogers (2016) added in video-based group reflections to lesson planning and enactment to support the development of teacher candidates’ PCK. And although Davis and Smithey (2009) state that teacher educators may only be able to support the development of ‘PCK readiness’ because teacher candidates do not have much teaching experience to draw upon, it is widely agreed that strong science PCK is a necessity for successful science teaching. Abell, Appleton, and Hanuscin (2010) state that the “main aim of a science methods course is to produce graduates who…have a ‘starter pack’ of PCK for science teaching” (p. 81). They go on to suggest that teacher candidates in methods courses should not only learn about science content, curriculum, and the nature of science, but also how to elicit students’ understandings of science, use that data to make informed decisions, and have the knowledge and skills to design instruction that support student learning. These results draw upon the foundational characteristics of PCK that science teachers should have (Veal & MaKinster, 1999). However, as Magnusson, Krajacik, and Borko (1999) and Veal and MaKinster (1999) note, content knowledge is the foundation for PCK. This leads science teacher educators to ask, how does one support the simultaneous development of science content knowledge, pedagogy, and science PCK? Teacher candidates at all levels learn science content and pedagogy so that they are able to teach the concepts in the appropriate manner to K-12 students. While in college, teacher candidates have the opportunity to enroll and complete science and pedagogy courses, but what happens once they begin their professional career? How do teachers maintain relevancy and stay current with new content or pedagogical practices throughout their career? Lifelong learning of science content and pedagogical strategies should be an emphasis in all methods courses. This is often accomplished by establishing and/or participating in a professional learning community (PLC) or communities of practice. One outcome of a PLC is to increase teacher candidates’ self-efficacy in science by exposing them to inquiry in science during their methods course (Avery & Meyer, 2012) as well as help them to learn more science content. A properly formed PLC can connect and scaffold the teacher candidates’ transition from pre to inservice educator establishing them as lifelong learners (e.g., Akerson, Cullen & Hanson, 2009). Without a proper transition, the elementary teacher candidates with low self-efficacy can become in-service teachers who are less likely to seek out professional development that would support improved science teaching (Ramey-Gassert, et al, 1996). In addition, it has been found that if elementary teacher candidates are uncertain about science then they are less likely to use inquiry oriented pedagogy (Appleton & Kindt, 1999; Ramey-Gassert, & Shroyer, 1992) and the performance of their students can be affected (Bybee et al, 2006). One method to break the continuous cycle of unprepared elementary (K-6) teachers to teach science is to connect them to a community of practitioners during their science methods class as well as throughout their career. One such community could begin in a science methods course and exist as an on-line platform that allows them easy access to content, new pedagogical techniques, and classroom activities that they can rely upon throughout their career. This community could become a source of guidance as they continue to grow as professional educators of science no matter what grade level they end up teaching. The learning community that the methods instructors establish in their science methods courses must involve the learning of pedagogical strategies and content. Dogan, Pringle, and Mesa (2016) conducted a review of empirical studies investigating PLCs and determined that PLCs increased the science teachers’ content knowledge, PCK, and collaboration about student learning. Educator preparation programs are increasingly using the Internet to deliver and supplement their science methods courses with science content projects, courses, articles, and professional networks/forums. For example, Eicki (2017) studied how Edmodo could be used to create an online learning community for learning to teach science. Part of this learning community involved the communication and exchange of lesson plans and opinions about lessons in an online platform. Given the vast nature of the Internet, it can sometimes be difficult to gauge the quality, applicability, or ‘user-friendliness’ of Internet resources. To help instructors with this problem, there are multiple legitimate educational organizations that have sites for teachers, videos of instruction, and student- and teacher-based content. For example, in this article, we present multiple cases regarding the use of the National Science Teachers Association (NSTA) Learning Center (LC) as a website in which teacher candidates can learn more about science content, find pedagogical tools that match the content, and begin to see the NSTA LC as a learning community. While this article is not an endorsement of the NSTA Learning Center, we are using the Learning Center as an example of how this site can support teacher candidates in developing the dispositions to become lifelong learners in the science education community. In science methods courses, instructors try to bring together pedagogy that is appropriate to the science content at the level in which the teacher candidates will teach. The problem with developing one course that fits all students is that science methods courses are often geared toward the developmental level of the future K-12 students. Research evidence suggests that if elementary teachers feel unprepared or negative towards science then they are less likely to teach science to their students (Ramey‐Gassert, Shroyer, & Staver, 1996). The disposition to teach science content using appropriate pedagogy is needed. At the elementary level – which can span pre-kindergarten to eighth grade in some states – most methods courses are focused on broader PCK because it is nearly impossible for the teacher candidates to know the science content across all four science disciplines. However, while elementary standards at each grade level require more integration of concepts and less depth of science-specific knowledge, to choose the appropriate pedagogy to teach content well, one must first know the content itself well. Unfortunately, most elementary teacher candidates only take 2-3 science courses as part of their general education requirements that do not prepare them to teach the breadth nor the depth of science concepts in the standards. Many middle level certificates overlap grade spans with elementary and secondary, so there exists the potential to have a pedagogically strong teacher needing to teach depth in a science or multiple science areas. For example, in South Carolina elementary certification includes grades 2-6 and middle school includes grades 5-8. On the other extreme, a science discipline teacher may be called upon to teach other courses at the middle school. Middle schools across the country may require science teachers to be proficient in all areas of science (e.g., biology, physics, geology, Earth science, astronomy, and chemistry) since the state or national standards are more integrated or each grade level requires multiple science areas. For example, many states have a general middle grades certificate for science, but Oregon has middle level certificates in each of the science disciplines. How can a middle grades teacher be proficient in all disciplines of science? Just taking the introductory courses in each of the four major disciplines would equate to 32 hours of science (lecture and lab for all courses); and, of course, none of these courses would likely teach how to teach these content areas. In addition, even if they successfully completed these courses, odds are the courses do not cover the basic science content they will teach. The NSTA Learning Center is an online resource that can be utilized for preservice and inservice teaching and learning by providing a professional learning community in which teachers learn from one another by sharing content knowledge, lesson plans, and strategies. The NSTA Learning Center is an online repository of articles, book chapters, webinars, and short courses aimed at improving the content and pedagogical knowledge of preservice and inservice teachers, connecting teachers through online chats, and delivering depth and breadth of science content for primary, middle, and secondary teachers. The science content, interactive learning modules, and articles are peer reviewed and vetted by content and pedagogical experts. The implementation of this type of content has been described as blended learning by Byers and Mendez (2016). Blended learning involves using online resources with “on-site efforts” to teach students. The case studies in this article show how blended learning, inquiry, project-based learning, and independent learning can be supported to provide science content knowledge, pedagogical knowledge and PCK to teacher candidates. While elementary and middle school science methods courses cannot provide all the science content and pedagogical strategies they will teach and use, these science methods courses can provide an opportunity to demonstrate and model effective lifelong learning skills. One university offers certification through an early childhood (K-3) Masters of Education (MEd) program. The science methods course is designed to support teacher candidates learning of 1) pedagogical content knowledge, 2) science content knowledge; and 3) connect them to a community of elementary teaching practitioners to support their life-long learning of the teaching of elementary science. The learning experiences provided them with an understanding of science teaching and learning from the perspective of both learner and teacher. Though this is not a science content course, the class does utilize model lessons that exemplify science standards elementary teachers are expected to teach as outlined in national science standards such as the Next Generation Science Standards (NGSS Lead States, 2013). In order to foster long-term and sustained improvement in standards-based science teaching and learning in elementary schools the teacher candidates are asked to demonstrate their understanding of these standards documents by engaging in lesson development during the semester that exemplifies not only the content standards but also exemplary science pedagogical methods grounded in scientific inquiry. 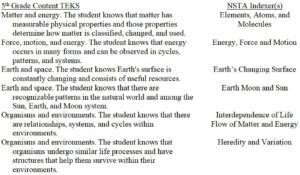 The NSTA LC allows the teacher candidates to encounter the use of the 5E method within classroom activities via articles in Science & Children as well as Science Scope, two practitioner publications from NSTA. In addition, NSTA LC e-book chapters are regularly utilized throughout the course. The elementary teacher candidates are required to use the online site as a source of articles about teaching science, as well as basic educational research supporting practice. These NSTA LC resources are used by the teacher candidates to help them develop lesson plans that are based on activities that excite students as well as connect to science content standards. The teacher candidates were required to use the Science Objects and SciPacks to learn science content new to them or review content that they were uncomfortable teaching. One goal of the online communities is to illustrate to them that the SciPacks could not only support their content background but usually contain a list of the most common alternative conceptions held by students thus supporting their lesson planning. At the beginning of the class the teacher candidates had voiced concern about not knowing their students’ alternative conceptions due to their own limited science background so this practice alleviated this concern. As one teacher candidate stated, “The articles were very practical and could be used directly in our classroom. Science is the subject I am most hesitant to teach but the readings made me see how I could teach it.” Several teacher candidates mentioned that they would buy the subscription in future years so they could continue as a member of this community of practice as in-service teachers. At one Texas university, the NSTA LC has been adopted as the textbook for the Elementary Science Methods course and has been used for the past five years. Teacher candidates have access to the LC during their final methods block of courses prior to student teaching and during student teaching the following semester. Teacher candidates seeking the elementary teaching credential (EC-6) are required to complete four courses in science that must include one course in introductory Biology, Physical Science and Earth Science in addition to pedagogical courses. Typically, teacher candidates seeking elementary certification enroll in science courses for non-science majors. As these are general science courses, there are no guarantees that these courses prepare future elementary teachers in the science content they will be required to teach their future students in the EC-6 classroom. One of the goals of the course is to prepare teacher candidates to use assessment data to plan and deliver targeted instruction. On the first day of class, teacher candidates complete the latest released version of the State of Texas Assessment of Academic Readiness 5th grade science assessment to develop familiarity with the state assessment and to assess their understanding of the elementary science content they are accountable to teach upon completion of their degree. Preservice teacher results on the 5th Grade STAAR (state level assessment in Texas) released assessments tend to be disappointing in spite of earning passing grades in the university level science courses. The disconnect between scores on the 5th grade STAAR is in part due to lack of alignment of university science courses that elementary teacher candidates complete and the content they will teach. This creates a dilemma for the science methods instructor. Should class time be utilized and designed to prepare elementary teacher candidates in PCK to remediate content knowledge or stay focused on pedagogy? Future teachers need to be prepared in both content and pedagogy. One without the other is problematic. To address this issue, the teacher candidates analyze the results of their personal STAAR score. Questions on the released test are categorized by science discipline, and as a PLC they work together to identify the state standard and the Texas Essential Knowledge and Skills (TEKS) each item addresses (Texas Education Agency, 2017). During this process, teacher candidates identify their areas of science content weakness and complete the appropriate NSTA Indexer in the LC for each content area in need of further development. The course instructor identifies and suggests NSTA Professional Development Indexer assessments that align to the content subsections of the STAAR assessment to help guide teacher candidates. Table 2 shows the science content TEKS and the appropriate corresponding Indexer Assessment. Typically, teacher candidates complete 3-4 of the NSTA Indexer assessments as a result of the STAAR analysis. The number of Indexer assignments has ranged from 1 to 6, which depends upon their background content knowledge. For the purpose of this course, the teacher candidates were required to complete both the pre and posttests. While the STAAR was used due to contextual location of the university, the NSTA Indexer can be used nationally. Once teacher candidates complete their Indexer assessments, the methods professor works with each candidate to select up to two NSTA SciPacks to remediate their content knowledge in the targeted areas. SciPacks are online modules that are completed outside of class. On average, the teacher candidates improve their content scores on the NSTA Indexer by 40% when they take the posttest compared to the initial indexer score. Elementary teacher candidates have shared anecdotally that the SciPacks are very challenging. Using the Indexer and SciPacks allows the instructor to focus on PCK in class and improve teacher candidate content knowledge without sacrificing class time that is dedicated for pedagogy. The analysis of personal assessment data from an online science teacher site provided the scaffolding for these teacher candidates to become lifelong learners. In 2012, North Carolina Department of Public Instruction sent three representatives to Washington, DC to consult on the development of the Next Generation Science Standards. As representatives for one of the lead states for standards adoption (NGSS Lead States, 2013), the representatives were also charged with curricular development for K-12 science classrooms in North Carolina and by extension, science teacher education and professional development. NGSS considers science learning within a 3-dimensional framework: disciplinary core ideas, science and engineering practices, and crosscutting concepts. Shortly thereafter in preparation for NGSS standards adoption, the elementary science methods course was reconceived, using the NSTA LC. The use of NSTA LC addressed a number of concerns. The elementary undergraduate teacher candidates in the university’s programs are extremely diverse. They have attended all manner of public, private, parochial, and home schools. As a result, their level of science pedagogical understanding is not uniform. Before enrolling in the science methods course, all teacher candidates had to pass at least one college-level life science and one physical science course. Performing well in these courses provided no guarantee of attainment of the extensive science content needed to support K-6 science content knowledge. These teacher candidates also take the NSTA Indexer, content pretest, as the first step in designing a self-study program that will fill the holes in each teacher candidates’ science content knowledge. Teacher candidates take the same Indexer posttest to determine how well they have developed their content knowledge through self-study over the semester. The teacher candidates must contend with having to complete their studies in light of securing and sustaining employment, and using the NSTA LC allows them the course schedule flexibility to become a certified teacher. In other words, if they cannot work, they cannot complete their studies. For many, maintaining employment interferes with their studies. Using the NSTA LC allows the teacher candidates to continue to work on their classroom assignments in between their employment responsibilities. By being able to access their assignments using their e-textbook and having access to other preservice and inservice professionals, they can study, ask questions, and share their concerns without carrying heavy textbooks or waiting for office hours. The PLC emerged from the need to find a different pedagogical approach to science methods due to the personal nature of the candidates. The University’s motto is, ‘Enter to learn, depart to serve.’ The responsibility to promote social justice and lifelong learning is palpable throughout the campus. The teacher candidates are required to buy access to their NSTA LC e-textbook for a year. This allows them to use this resource through their methods course and student teaching field experience in which they have time to strike up online discussions of national and regional social justice issues. Course evaluations and online data about the teacher candidates’ usage of the NSTA LC indicated that teacher candidates who demonstrate the highest level of science efficacy, as measured by course grades and use of the online resources, were also the ones who have taken greatest advantage of participation in the online learning community. For example, several teacher candidates mentioned how they increased their excitement and comfort with searching for and learning about science content and science lessons. Those who have less science efficacy are reluctant to communicate and ask questions with practicing teachers in the online forums despite knowing its value. Data gathered through the NSTA LC administrator’s page, indicated that as science efficacy increased over the span of the science methods course, teacher candidates took advantage of the online science learning community. Since all teacher candidates were required to maintain an online ‘portfolio’ (Professional Development Indexer or Learning Plan), there was an increase in the amount of online artifacts (downloadable chapters, articles, lesson plans, podcasts, and videos) from the beginning of the year to the end. The adoption of the NSTA LC supports teacher candidates to conceive science from a 3-dimensional, national perspective, rather than a 2-dimensional, state perspective. It allowed the diverse teacher candidates to personalize their learning of science content with the accessible 24/7 access to content, pedagogical strategies, and online discussions of various social justice issues. The improvement of lifelong learning through the use of an online professional development community requires continued study, but the outcomes are most promising. In one university in Idaho, teacher candidates seeking an elementary (K-8) certification take one science methods course, typically at the junior or senior level, one or two semesters before they embark on their year-long field experience. Prior to taking this course, PSTs must have taken two natural science courses with labs (for a total of 8 credit hours); these prerequisites run the gamut from geosciences to astronomy and from biology to chemistry. On the first day of class, teacher candidates are asked to describe their feelings about teaching science at the elementary level. The responses are typically split evenly, with half providing some version of “scared” and half providing some version of “excited.” The case describes a journey into how the implementation of NSTA LC evolved over a year of teaching a science methods course. The NSTA LC was first implemented into this elementary science methods course in the Spring of 2016 with three goals in mind: 1) to introduce teacher candidates to a supportive professional community; 2) to provide science content knowledge support when needed; and 3) to use practitioner articles to illustrate topics in the course. 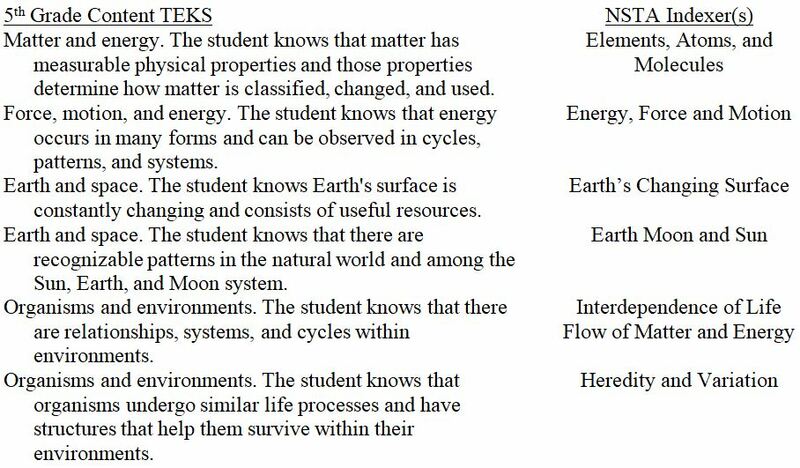 Given the wild variations in content knowledge encountered in the teacher candidates in the course, the implementation of the NSTA LC resources were used to immediately support teacher candidates in their science understandings for the course, and also demonstrate how one could use the LC to learn/review content for future teaching. Throughout the semester, the teacher candidates were required to complete three Science Objects that related to elementary science centers (Kittleson, Dresden, & Wenner, 2013) they taught during the semester. Unlike the case studies discussed above, candidates in this class were not required to complete the entire NSTA PD Indexer for the course, but rather strongly encouraged to complete this and ‘brush up’ on content prior to their science PRAXIS tests. Indeed, some candidates did recognize the usefulness of the LC in terms of boosting content knowledge that then enabled them to better structure their science centers, and by citing how it could support “individual learning” for the PRAXIS tests and in their careers. Beyond qualitative responses on course evaluations, downloaded statistics from each class cohort on the NSTA LC paint a promising picture: The majority of candidates downloaded at least ten Science Objects and SciPacks throughout their semester in the course. While downloading these resources does not necessarily mean that candidates completed/intend to complete them, anecdotally, teacher candidates shared that they often download the Science Objects and SciPacks as a preventative measure of sorts, thinking about what they may need to learn/review once they have their own classrooms. It is certainly encouraging that PSTs acknowledge they may have gaps in their content knowledge and see that the NSTA LC may be a way to help fill those future gaps. The use of practitioner articles found in the NSTA LC brings the realities of science activity implementation into the classroom. The articles connect theory and practice and illustrate what elementary science can look like. On average, 30 NSTA practitioner journal articles (from Science and Children and Science Scope) are assigned for teacher candidates to read throughout the semester. These readings cover topics such as integrating the NGSS and Common Core State Standards (CCSS, National Governors Association Center for Best Practices & Council of Chief State School Officers, 2010) , argumentation, science for all students, assessment, and engineering at the elementary level. Many teacher candidates commented on the usefulness of these articles, stating, “The articles that we read were beneficial and related to the discussions we had in the classroom,” and “I will refer back to all the articles when I am teaching.” And while the majority of articles downloaded by teacher candidates were the assigned readings, nearly all of them downloaded additional articles related to other assignments in the course (lesson plans, student misconceptions, etc. ), indicating that teacher candidates found the articles to be useful resources. The ensuing discussions about content from the articles helped to establish an atmosphere of professional exchange of ideas to teaching science concepts that they intend to use well into their careers as lifelong learners. This elementary and middle level science methods course is taught at a university in the southeast. The course focuses on the PCK necessary to teach science, which includes science content knowledge and instructional strategies. Since the focus is on teacher candidates who will become certified to teach from grade 2 to 8, the focus is on general science pedagogy with content-specific examples so that activities and demonstrations can show the depth of concepts at different grade levels within the spiral curriculum. For example, two weeks are spent discussing misconceptions related to seasons and moon phases. The content is appropriate in that the activities relate the content at the fourth and eighth grade levels due to the science standards in the state. While discussing how to introduce and conduct activities, teachers need to know depth of knowledge so that they can address potential and real misconceptions. The teacher candidates must learn the content of why there are seasons and why there are different phases of the moon not just the facts of seasons and the names of phases of the moon. The course emphasizes learning appropriate science content knowledge for specific lesson plans so that inappropriate activities and misconceptions are not taught. While the course grade and objectives cannot require the students to know all science content knowledge in the grade 2-8 standards, it is a learning outcome that the teacher candidates can research the content needed for that lesson plan. Reading book chapters and articles and communicating with classroom teachers in an online platform helped teacher candidates understand how to teach specific topics better as evidenced by their graded and implemented lesson plans over the course of the semester. The NSTA LC was chosen for its ease of use and type of activities that could be used by teacher candidates so that they could learn content, develop pedagogical skills, and participate in a community of teachers who share ideas. The teacher candidates in the combined elementary and middle grades science methods course subscribe to the NSTA LC for six months. During this time period they download any content they feel they can and will use in the future. These downloaded resources are theirs for a lifetime. The NSTA LC is integrated into a project for integrating science content and pedagogy. The project requires the teacher candidates to take a pre-test exam, gather online resources from the site’s resources, complete mini-courses about the science topic, and complete a posttest after six weeks. While not part of the course grade, participating and engaging in the online professional discussions and posts is encouraged so that the teacher candidates learn to become part of an extended PLC. Besides the use of the NSTA LC as a project assignment, the website is used during normal instruction to show other possible activities, lesson plans, and explanations of concepts. The project and use of the NSTA LC is more of a self-guided endeavor because when they become classroom teachers they will have to learn more science content on their own and this is one effective method for doing it. Online learning of science content within a community of science teachers is how current teachers develop and grow the depth of their topic-specific PCK. This project and use of the NSTA LC allows teacher candidates to learn this process in a controlled environment in which the content is controlled and other professionals can assist in the learning to implement science content. I found the resources provided for us….like we got NSTA. Most of those articles were pretty applicable. They had ideas you could use in your own classroom. It is so beneficial. It was pricey but it was worth it as we used it every week. The site had very valuable information that I would use in the future. Part of establishing a community of lifelong learners is to develop the context in which teacher candidates can learn from multiple resources, participate in active dialogue about teaching and learning science, and develop appropriate lesson plans and activities using diverse sources of science content and pedagogy. The introduction and discussion of forming a community of lifelong learners necessitates the need for research to determine the benefits of using online, interactive, and collaborative sites in developing science teacher candidates. The idea and implementation of a single textbook and downloaded articles are gone. The new generation of teacher candidates need more dynamic and interactive methods for developing science content and pedagogy. Online sites for promoting lifelong learning of content, pedagogy, and PCK will become the standard in the near future. Akerson, V. L., Cullen, T. A., & Hanson, D. L. (2009). Fostering a community of practice through a professional development program to improve elementary teachers’ views of nature of science and teaching practice. Journal of research in Science Teaching, 46, 1090-1113. Appleton, K., & Kindt, I. (1999). Why teach primary science? Influences on beginning teachers’ practices. International Journal of Science Education, 21, 155-168. Avery, L. M., & Meyer, D. Z. (2012). Teaching Science as Science Is Practiced: Opportunities and Limits for Enhancing Preservice Elementary Teachers’ Self‐Efficacy for Science and Science Teaching. School Science and Mathematics, 112, 395-409. Dogan, S., Pringle, R., & Mesa, J. (2016). The impacts of professional learning communities on science teachers’ knowledge, practice and student learning: A review. Professional Development in Education, 42, 569-588. Ekici, D. I. (2017). The Effects of Online Communities of Practice on Pre-Service Teachers’ Critical Thinking Dispositions. Eurasia Journal of Mathematics Science and Technology Education, 13, 3801-3827. Kittleson, J., Dresden, J., & Wenner, J.A. (2013). Describing the Supported Collaborative Teaching Model: A designed setting to enhance teacher education. School-University Partnerships, 6(2), 20-31. National Governors Association Center for Best Practices & Council of Chief State School Officers. (2010). Common Core State Standards. Authors: Washington D.C.
NGSS Lead States. 2013. Next Generation Science Standards: For States, By States. Washington, DC: The National Academies Press. Ramey-Gassert, L., & Shroyer, M. G. (1992). Enhancing science teaching self-efficacy in preservice elementary teachers. Journal of Elementary Science Education, 4, 26-34. Ramey‐Gassert, L., Shroyer, M. G., & Staver, J. R. (1996). A qualitative study of factors influencing science teaching self‐efficacy of elementary level teachers. Science Education, 80, 283-315.